ServiceNow’s CMDB (Configuration Management Database) helps organizations track and manage their incidents, problems, changes, and service requests. ScienceLogic’s broad discovery and monitoring capabilities, integrated with ServiceNow enriches the CMDB and delivers clean, actionable data that helps IT operations resolve issues faster. Ensure the performance of your IT infrastructure by automatically logging infrastructure related incidents or events in ServiceNow. Dedupe and correlate events ahead of sending them—dramatically reducing the number of incidents or events ServiceNow has to manage and simplifying IT operations. By discovering and monitoring your entire infrastructure both onsite in your data center and in the public cloud, ScienceLogic’s platform ensures you have an accurate reflection of your IT estate—in real-time. It monitors and tracks key configuration details for all of your IT assets. Our integration with ServiceNow uses this real-time data to keep information about your CIs up to date—both populating CIs into your CMDB and updating fields within those CIs as they change. Automatically log actionable incidents in ServiceNow tied to the correct CI. Further, benefit from having the incidents correlated, deduped, and prepopulated with impact and urgency levels. With this integration your service desk team will only have to worry about one incident per infrastructure issue keeping them from chasing phantom incidents. 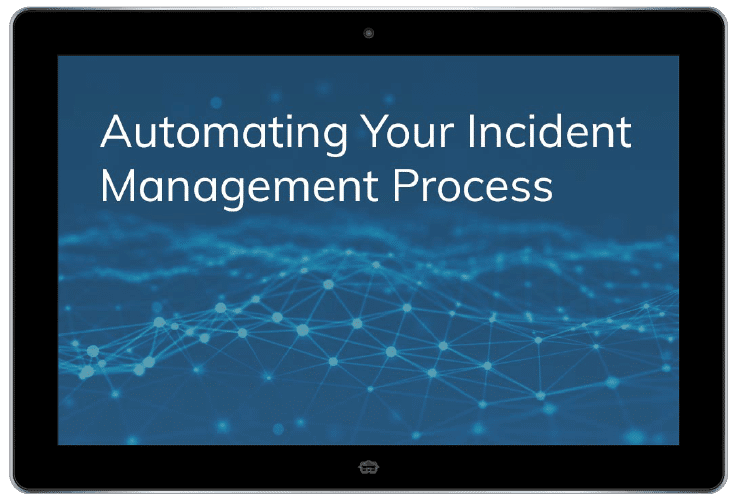 Finally, be assured your team will know the current state of an infrastructure related incident by having real-time incident updates automatically populated. Send events to ServiceNow’s Event Management function, giving you one consolidated place to manage events from multiple sources. 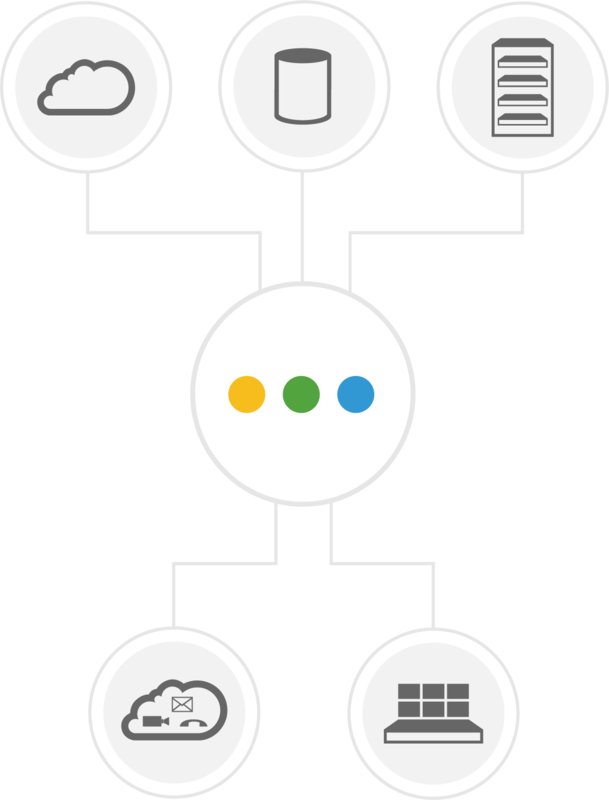 Augment ServiceNow’s CMDB by discovering CIs from next generation technologies such as Cisco ACI, Nutanix, Pure Storage, AWS, IBM Cloud, and Microsoft Azure – populating your CMDB with newly discovered CIs. Further, benefit from a current reflection of CI status by automatically populating fields associated with specific CIs, updating them as your IT environment changes. Our integration with ServiceNow is fully certified across the Geneva, Fuji, Eureka, and Dublin releases. Many organizations want to use technology as a competitive advantage, yet they are held back by monitoring and management platforms that don’t support the latest technologies. ScienceLogic strives to stay several steps ahead when it comes to technology adoption. So it doesn’t matter whether you are looking to use SDN solutions such as Cisco ACI, public cloud infrastructures such as AWS and Azure, or hyperconverged systems such as Nutanix, we have you covered. Rest assured, that when the next new technology comes to market, we’ll have that covered as well. Integrating ScienceLogic with your ticketing and asset management system can result in tremendous cost savings and staff efficiencies. 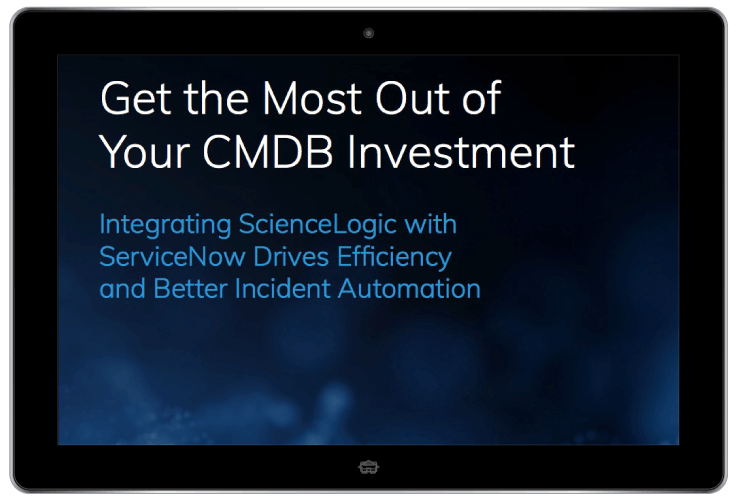 ScienceLogic ensures you start with the right data, so your ServiceNow CMDB can do its job. See – Our patented discovery finds everything in your network, so you get visibility across technologies and vendors running anywhere in your data centers, multiple clouds, or containers. Contextualize – Our relationship mapping helps you make sense of it all – infrastructure to applications to services – so you can use it to drive your analytics engine and business dashboards. Act – Detect and deploy corrective actions faster to avoid any negative impacts to your business operations, improve change management workflows, so your ServiceNow CMDB is always aligned with your IT operations, and use staff capacity efficiently.